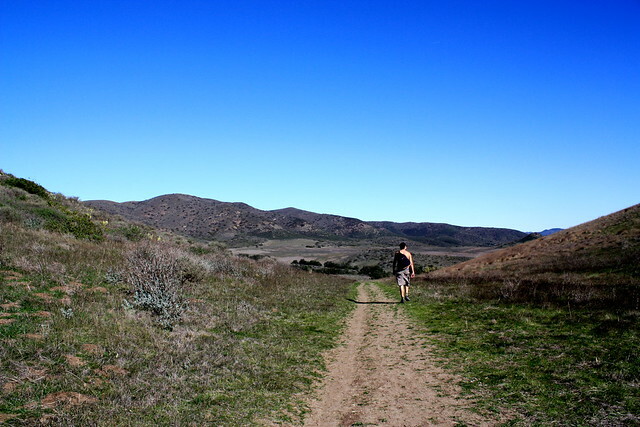 A very pleasant 5+ mile hike in the southern part of Point Mugu State Park. Low rolling mountains, sweeping meadows of native grass, spectacular coastal views, and a few sections of steep ascent make this a great way to spend a morning. Highly recommended in the spring. 5/28/13 – This area was badly burned in the Springs Fire in May of 2013. Official trails are open to hikers but may be closed depending on safety and erosion. Please check with rangers before you head here to make sure the route you’d like to do is open. 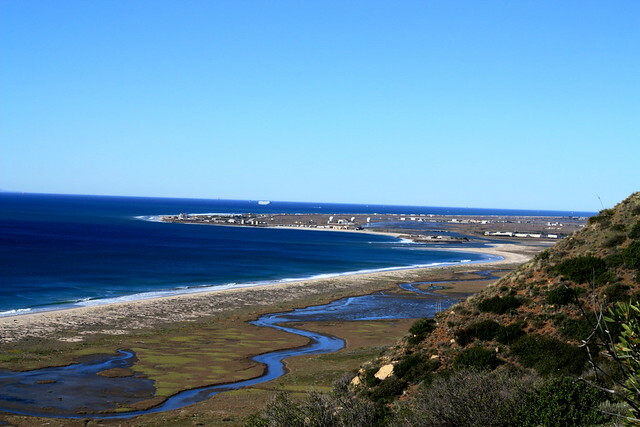 Point Mugu State Park stretches from Newbury Park in Ventura County through some of the most majestic parts of the Santa Monica Mountains, all the way to the Pacific Ocean. 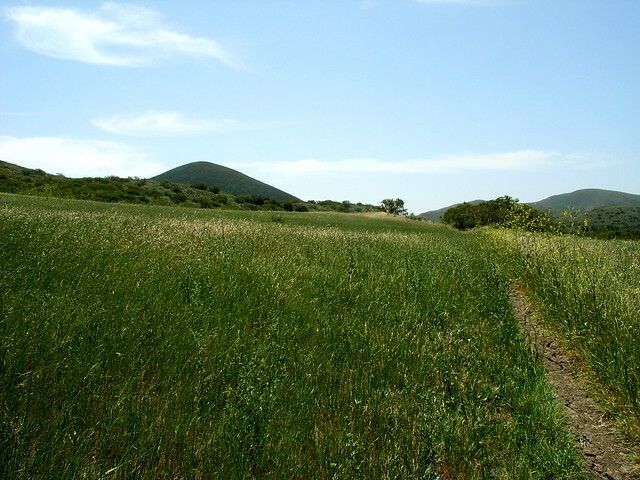 It’s one of my favorite places to hike in Southern California, for its uniquely Californian landscape, stretches of rare native grassland, and extensive trail system. 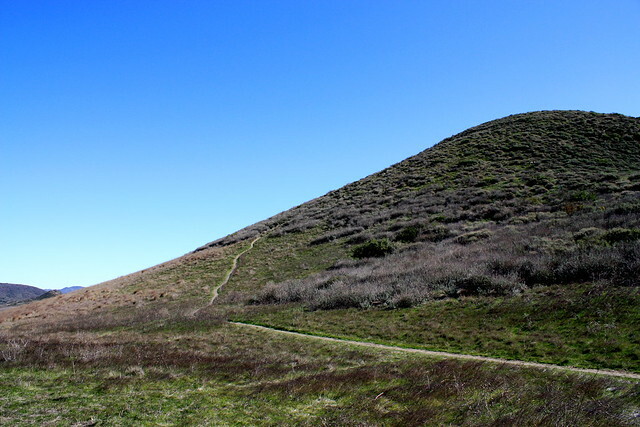 This loop around Mugu Peak starts on the southern end of the park, just outside the Point Mugu Naval Academy Base. In fact, the trailhead is just across the Pacific Coast Highway from the rifle range — which you’ll occasionally hear from your hike. The dirt parking lot can be easy to miss as you’re coasting down the PCH, so be sure to slow down when you’re getting close to the Navy grounds. There’s only one trail from the parking lot, and it’s marked with a large distance sign, as well as the requisite warning about ticks (even in mid January, I spotted a handful of the bloodsuckers waiting on grass along the trail!). 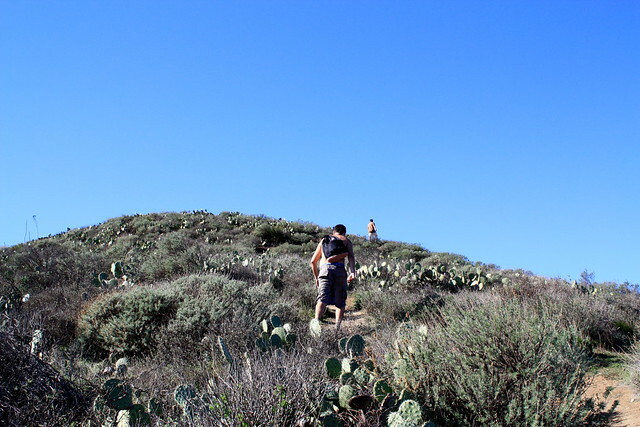 Tighten your laces, pull up your socks, and start climbing up the Chumash Trail. The Chumash Trail makes a pretty no nonsense ascent up the first incline, rising 870 feet in the first .65 miles. If it’s hot out, you’re going to feel this section — but it’s the steepest part of the entire loop, so don’t get discouraged. 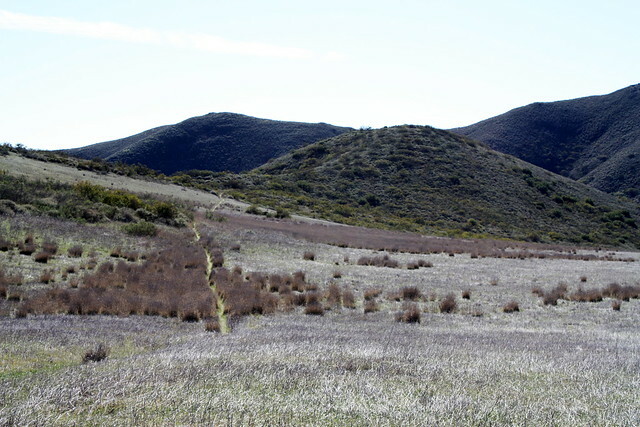 The trail makes its way up toward a rounded saddle between Mugu Peak and a slightly shorter bump to its north. 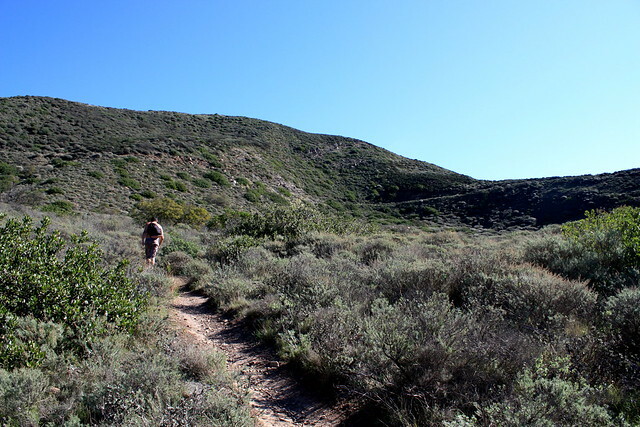 Here, the trail intersects with the Mugu Peak Trail, which appears to have been carved out of an old overgrown fire road. From the intersection, you can also make out a direct-ascent use trail up to Mugu Peak itself. If you’re just aiming for a quick trip to the peak, climb up this very steep trail for .4 miles and return the way you came. 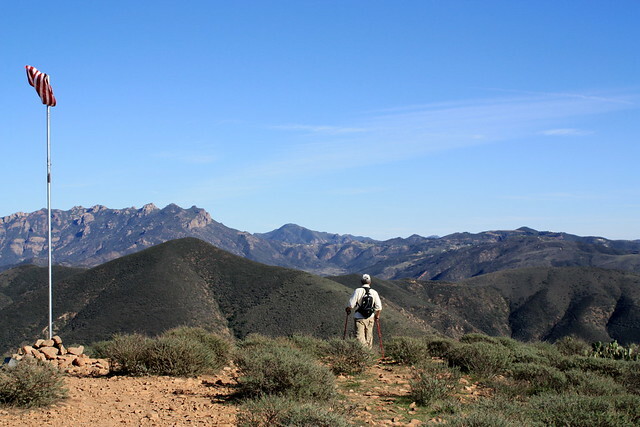 But if you’re here for the loop, veer left at the intersection with the Mugu Peak Trail and ignore the use trail that climbs the north slope of the peak, instead continuing east on the Chumash Trail. And prepare yourself — you’re about to see one of Southern California’s last remaining stretches of native grassland spread out before you. 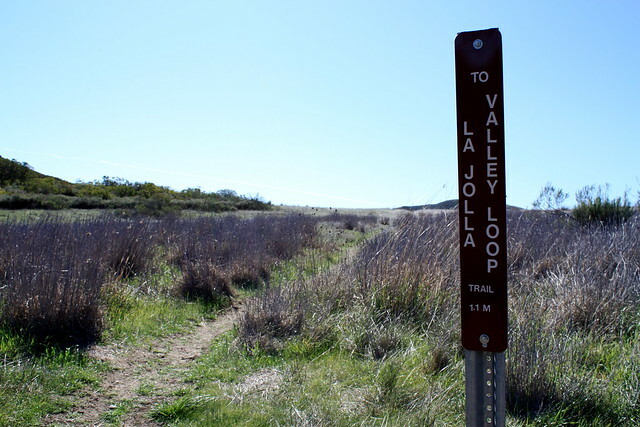 Continue a gentle descent into the valley as you hike northeast for about a half-mile, when you’ll reach the La Jolla Valley Loop Trail. Veer left at the junction to stay headed north. Taking the loop trail south here would cut out about a mile of your distance on the loop — and you’ll be stuck in the shadier La Jolla Canyon, where you won’t get to experience much of the meadows. The north end of the loop trail continues for another .7 miles through some very tall grasses, which at times threaten to overrun you. It’s very passable and easy to navigate — just be sure to check for ticks every once in a while. When you reach the next trail sign for the Loop Trail, turn right and head south back through the valley to continue this version of the loop. If you’re feeling extra frisky, continuing east will add up to 1.5 miles to your loop. You’ll pass a few backcountry trail camps, a small pond, and sections of a more dramatic canyon with a seasonal waterfall (see my La Jolla Canyon write up). From here, you’ll be able to make out the trail cutting a straight path through the grassland, as well as the lumbering Mugu Peak. As the trail takes a slight descent on its way south, you’ll pass very fragrant groves of sage and laurel, and you’ll get a great view southeast toward the steeper end of La Jolla Canyon as it presents the ocean once again. 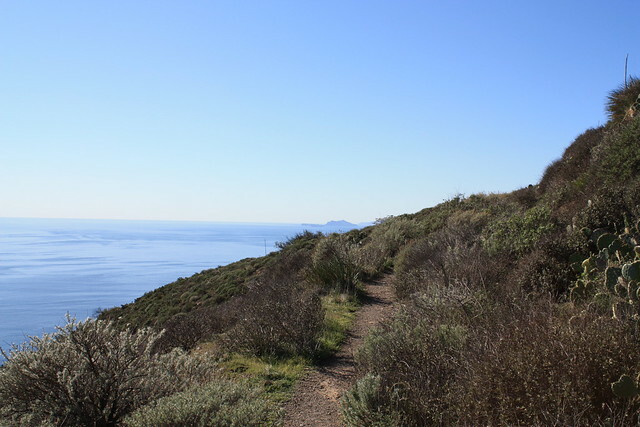 This is where the Mugu Peak Trail leaves the Loop route and continues back toward the ocean. It can be easy to miss while hiking by, mainly because it doesn’t look like there’s a trail back there, but if you do happen to miss it, there’s a marker a bit further along the Loop route — you’ll just have to backtrack a little. 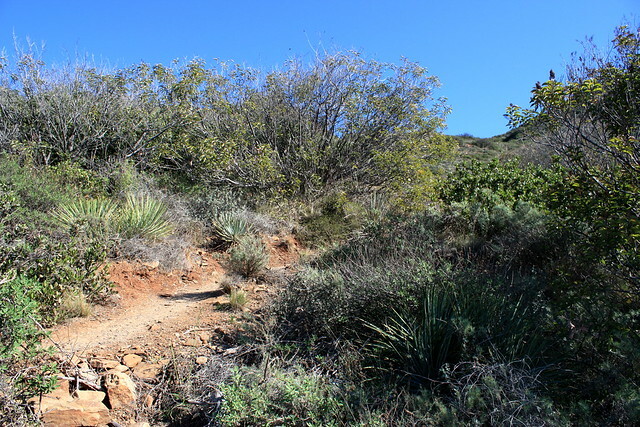 Continue on the Mugu Peak Trail until you hit a rough trail junction among some low cacti and brush on the south slope of Mugu Peak. The Peak Trail veers to the left here, missing the actual peak and looping around the west side of the mountain. Forget that, and head straight on a trail that makes tight zigzags through the brush up to the top of Mugu Peak. If you’re in doubt, keep an eye out for the peak with the flagpole on top — that’s your target. When you reach the top of Mugu, you’ll be rewarded with 360-degree views of some of the most beautiful parts of Southern California — the Channel Islands, Boney Ridge, Mugu Lagoon, the Great Sand Dune, and all of the meadows you just wound your way through. All this, and an American flag to boot. Cue the patriotic music and you’re all set. When you’re done soaking it all in, head north on the steep use-trail back down to the Mugu Peak Trail, then return to the trailhead the way you came. Excellent. All of the trails in this area are well-worn and well-marked, often with mileage to the next intersection or landmark. The use-trails to Mugu Peak are not officially marked, but are very easy to spot. 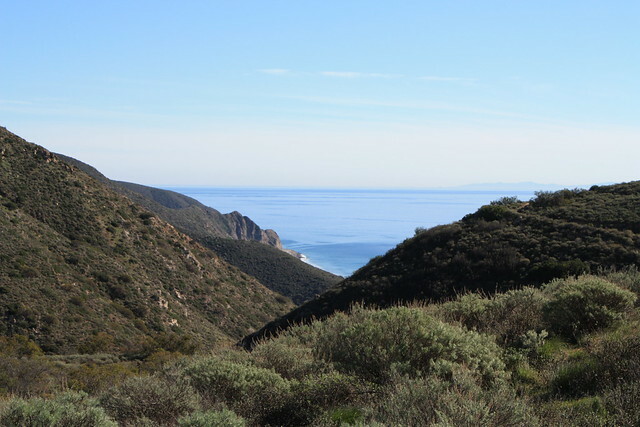 Sycamore Canyon Campground is a developed, reservable campsite further south on the PCH. 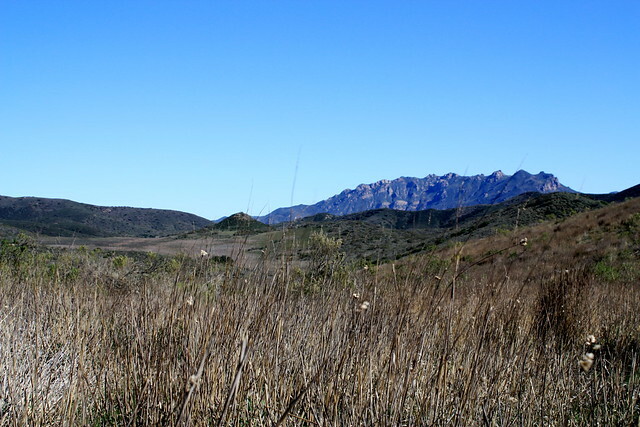 Additionally, there are some nearby backcountry walk-in campsites to the east of this route in La Jolla Valley. On the Pacific Coast Highway coming from the south, cross into Ventura County. Look for the Point Mugu Naval Base on your left, past Mugu Rock. There is a small dirt lot across from the rifle range, about 10.8 miles north of Decker Road. If you're coming from Ventura, this turnoff is 2.3 miles south of the intersection between the PCH and Las Posas Road. This is not a moderate hike, challenging for sure. Do not go in the summer unless you go at dawn. Super hot and no shade. Ticks are everywhere. Hike frequently but will not return to this hike in the summer. The areas damaged by the fires have all been opened. The Park still has the right to close certain sections, but odds are you're in the clear. We are planning to go there this Sunday :) thanks for your reviews ! By the way is it open now?? 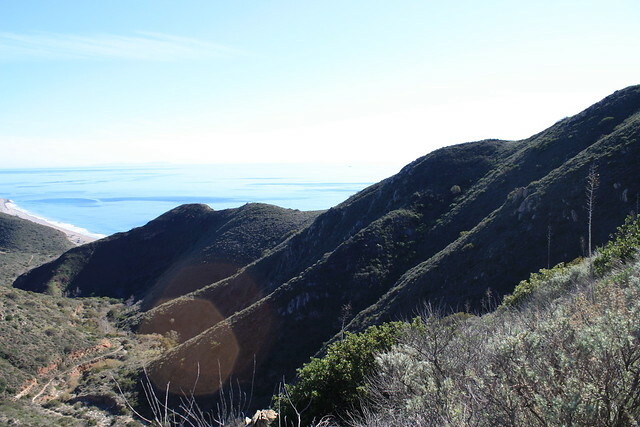 I'm planning a trip in August and am trying to plan the shortest possible Point Mugu hike, yet with some kind of really spectacular view like this one: https://www.google.com/search?q=ray+miller+trailhead+point+mugu&espv=2&biw=1366&bih=667&source=lnms&tbm=isch&sa=X&ved=0ahUKEwjk0NzhzqDMAhWFtIMKHZnSDwcQ_AUICCgD#tbm=isch&q=point+mugu&imgrc=NbzfHW0gMyy1rM%3A (hopefully that link brings up the picture I want. Some kind of view overlooking the water). We'll be at the beach beforehand, and didn't want to wear ourselves out with a full 3-hour hike afterwards. Thanks so much!!! My husband and I completed this hike yesterday. Make no mistake, the first 1/2 mile is brutal, and may even deter you....don't let it! Once you make the incline, the trail is much more relaxed, and you can enjoy the scenery you earned. Not easy, but WORTH IT! We just hiked this today. The directions were perfect. 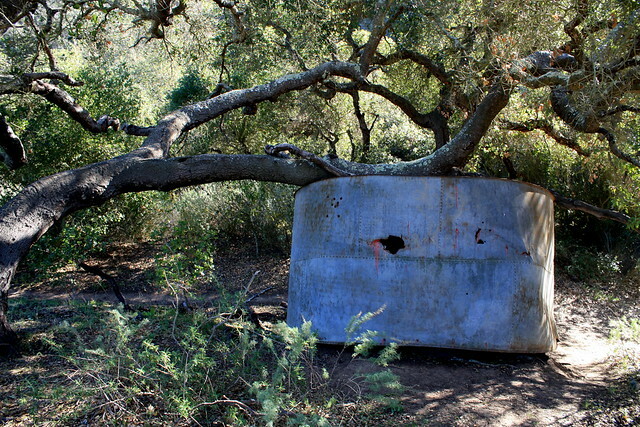 It was a little hard to find the trail by the water tank, you have to cross a stream and walk through some oak trees but the trail picks back up. Just a warning that this place is covered in ticks, you can actually see the ground moving with them. Ugh. So many. So glad you enjoyed it! That's still one of my favorite parks - maybe even more so since the fire. It's fascinating to see how the landscape recovers, isn't it?